Lot Detail - 1939 All Star Game Multi-Signed OAL (Harridge) Ball with (23) Signatures Featuring Gehrig, DiMaggio, Foxx, Ott Etc. 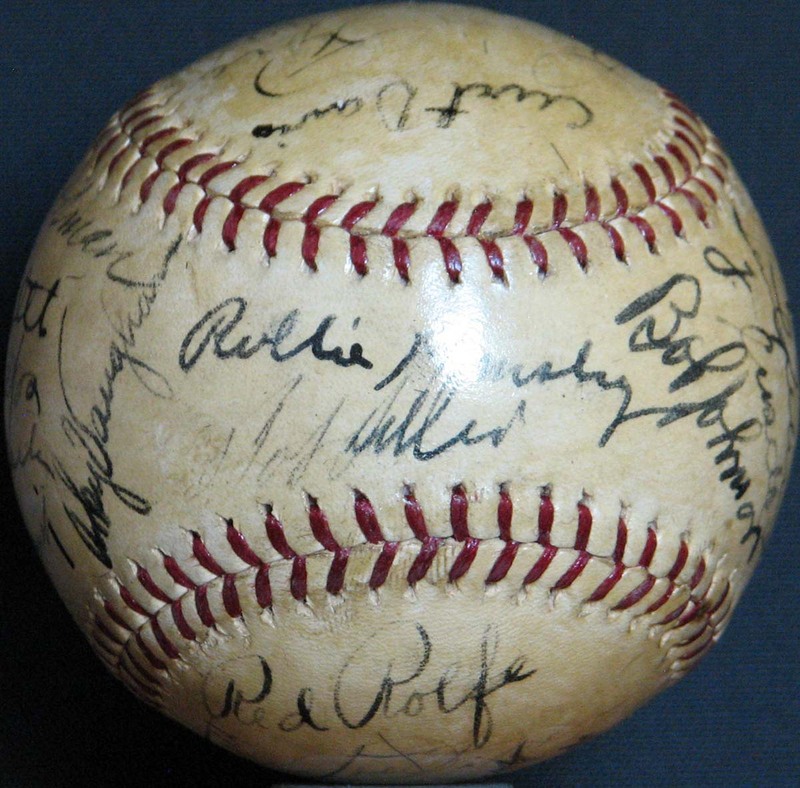 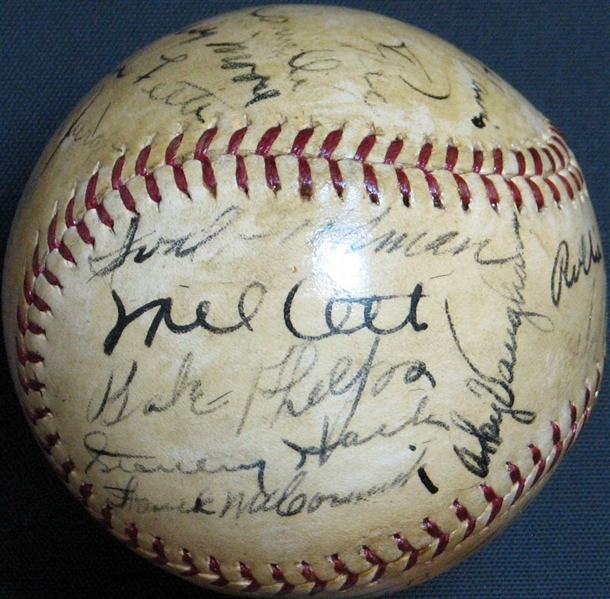 1939 All Star Game Multi-Signed OAL (Harridge) Ball with (23) Signatures Featuring Gehrig, DiMaggio, Foxx, Ott Etc. 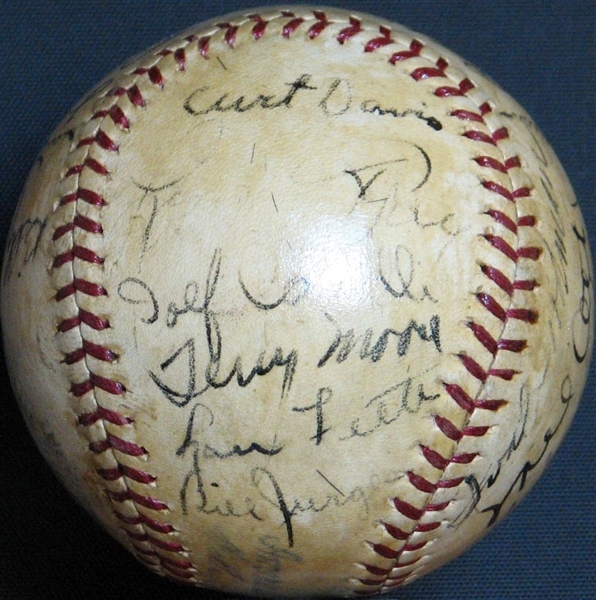 The 1939 All-Star game was played at Yankee Stadium on July 11th before a crowd of over 62,000 in attendance. 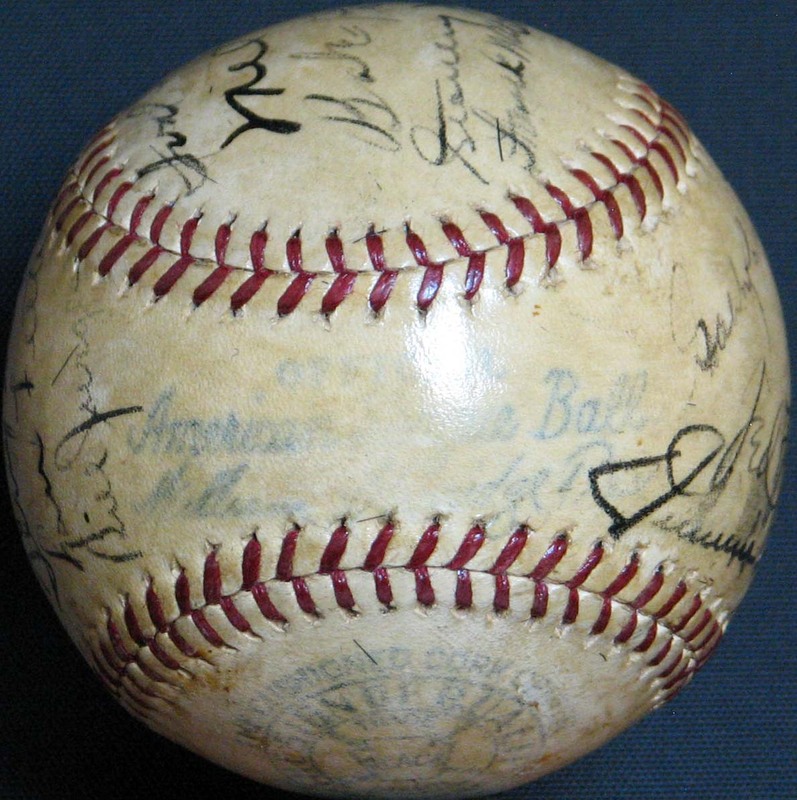 Though both teams were packed with future Hall of Famers, the game came down to pitching, highlighted by a 5th inning homer from Joe DiMaggio and 3 2/3 innings of scoreless relief by Bob Feller that led the American League to a 3-1 victory. But perhaps the greatest moment of the game was the announcement of first baseman Lou Gehrig during the introduction, having given his "... luckiest man on the face of the Earth" retirement speech a week prior to the game. 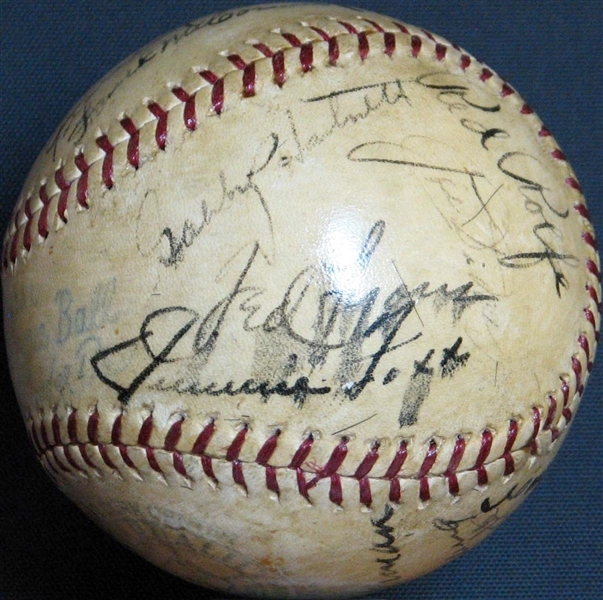 His jersey number already retired at that "Lou Gehrig Appreciation Day" ceremony in Yankee Stadium (the first player in major league history to receive that honor), "The Iron Horse" donned his New York pinstripes one last time to participate as a member of the American League All-Star team for the 7th consecutive season. Featured is an Official American League (Harridge) Reach baseball that is signed by 23 members of that thrilling contest, including a very bold signature of Lou Gehrig in his farewell appearance that is flanked by Frank Crosetti and Billy Herman on the panel below the stamp. Jimmie Foxx, Mel Ott, Joe DiMaggio and Arky Vaughn follow Gehrig in the cavalcade of legendary signatures, which includes, Harnett, Lyons, Rolfe, Davis, Camilli, Moore, Fette, Jurges, B. Johnson, Goodman, Phelps, Hack, and McCormick. 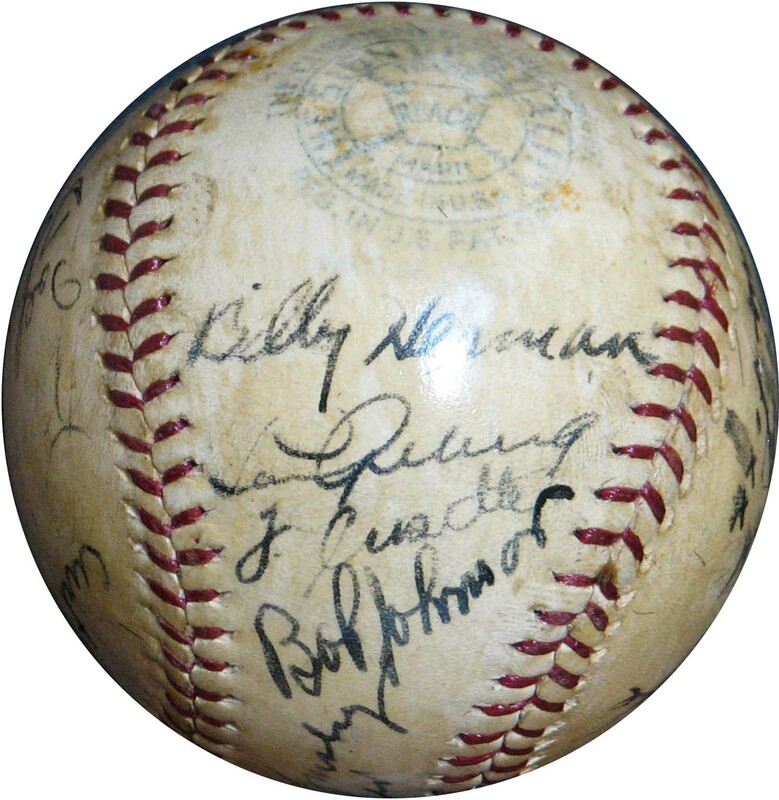 Bob Feller and Rollie Helmsley share the sweet spot and the ball has a light coating that amplifies the beauty of the signatures with only light browning of the sphere. 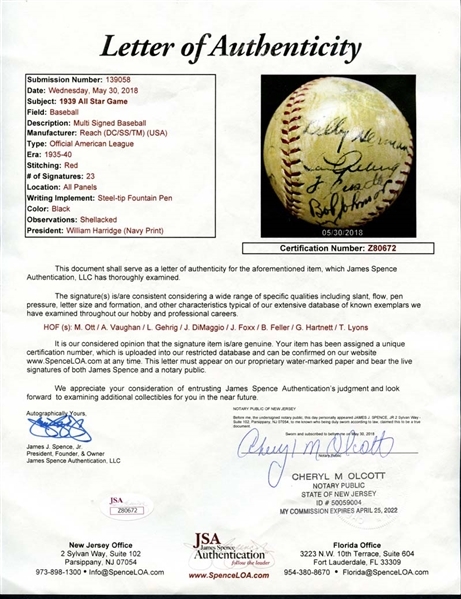 An incredible piece of baseball history that provides a fitting climax to the great career of Lou Gehrig. Full LOA from JSA.